Will a certain food make gout better or worse? What foods should I avoid for gout? Gout pain makes you miserable, and when you don’t know what to eat, it just makes things worse. My best advice is not to listen to what other people tell you about gout food and diets. Gout varies a lot between different people. What suits one person is unlikely to suit you. Here are my best tips for gout diet. The best gout foods are those that help your gout treatment plan. Different foods help at different times. So, before you think about gout foods, you should think about a gout treatment plan. Please don’t think this means going to the doctor and committing to a lifetime of meds. If you want to do that, I will help you get the best treatment that is right for you. But, if you want to control gout through diet, you still need a plan. If you don’t have that plan, any changes you make to your diet will be random. They might help, but they probably won’t. If you don’t have a personal gout treatment plan, just ask in the gout forum, and I’ll help you create a personal plan that works for you. When you first get a gout attack, you need the pain to stop, and nothing much else matters. There is not much you can do as far as food is concerned during a gout attack. Some gout foods have anti-inflammatory properties, but the effects are not strong enough to overcome gout pain. After your second gout attack, you want to stop gout coming back in future. Good food choices can definitely help here, though the effects can take many months to be apparent. There is a common belief that gout goes away when the pain stops. This is not true. The uric acid crystals that cause gout, continue to grow and spread. You have to get a treatment plan that get your uric acid levels safe. Food can help, but results take time, so you have to be patient. It is well worth considering uric acid treatment. Many gout sufferers do not want to commit to allopurinol, or similar, every day for life. If you have similar feelings, consider taking uric acid treatment for a year to give your diet changes chance to take effect. As you surf the Internet, you will find hundreds of lists for foods that are good for gout, and foods that gout sufferers should avoid. These lists are useless because they miss the most important factor – you. My approach is to tell you about the relationship between certain foods and gout. I then encourage you to create your own diet that includes your favorite foods. If you create an eating plan full of foods you do not like, you will never enjoy it, and you will never stick with it. The key to healthy eating for gout is to strive for moderation and balance. A moderate serving of meat, balanced by 3 to 4 times more vegetables makes a perfect meal for gout sufferers. You can take that further with extra coffee, vitamin C, milk protein, and similar foods that truly help lower uric acid. There is lots of information in my gout diet guidelines, or use the search box near the top of every page. What Gout Foods Can I Eat? 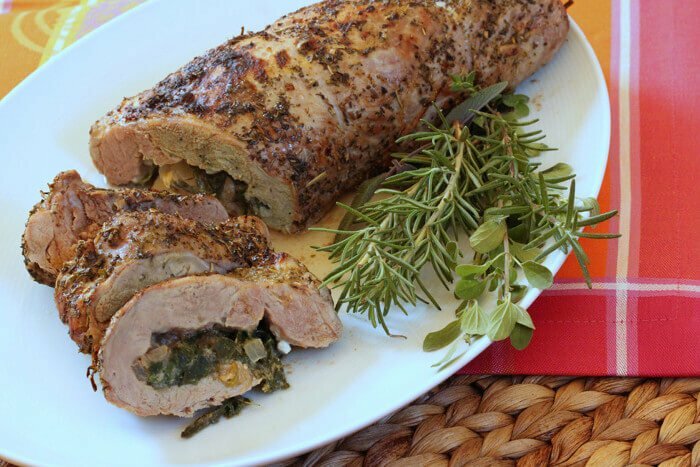 Stuffed Pork Tenderloin – a great treat for careful gout dieters. Your best way forward is to start with your favorite foods. Then create balanced meals from them. If you need help, then that is what I am here for. Ask in the gout support forum. 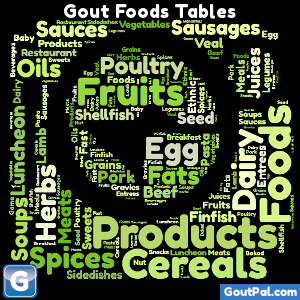 I include gout foods data in my nutrition summary for gout food. So, to see your favorite gout foods, ask me to add them to the gout food list. What is OK for gout sufferers to eat = everything that is a whole food, in moderation, with a healthy balance, and mostly plants. What foods gout sufferers must avoid = processed foods, especially processed meats, excess calories, excess iron, meat more than twice a month, fish more than twice a week. Ask “How can I make food that I like, better for my gout?“. But replace ‘food that I like’ with your own favorite food. Leave What Gout Foods Can I Eat? to browse the Gout Diet Guidelines.